You were just thinking, gee, I wish I could hear a German translation of How The Grinch Stole Christmas, weren’t you? Well! Your wish is my command. How the Grinch Stole Christmas, by Dr. Seuss. Read aloud by me with help from Karen the Cat. Here’s a little present for you – the recording I made last year of Dylan Thomas’s “A Child’s Christmas in Wales”. Henry passed his driver’s test today. I’m so proud of him! Way to go, Henry! It’s a really odd feeling, though, knowing he’s at Kung Fu but that he drove himself there and will drive himself back. I’ve driven him everywhere for 16 years. Baked two kinds of cookies and two enormous pizzas with Chloe this evening. Super fun! And then we watched most of this great George Harrision biography, which had a ton of footage and photos that I’d never seen. All tired out. Bed, book, cat, Dan. Dec 7, 2011 — A Christmas Miracle revisited! 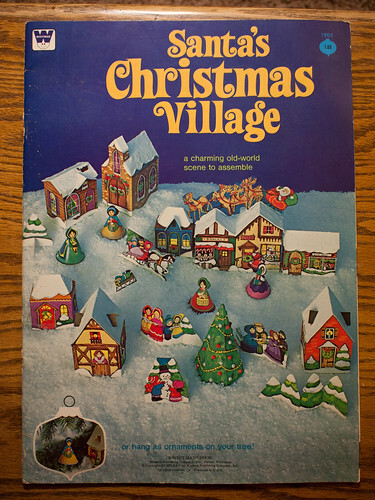 Remember my post from last March about my search for “Santa’s Christmas Village”? Well, after all these months I finally have the scans ready for you to download. It took a lot of work because the original book was quite large, so I had to slice up every scan and do a lot of rearranging to make them all fit on 8.5 x 11 paper. Sorry, non-USA friends, I don’t have it in me to optimize for A4 paper, but each image is no larger than 7.5 x 10 (I allowed for a half-inch of margin on each side) so if you print at something like 95% I think it will work. Test first on one of the larger images and make sure nothing gets cut off. Ok! Here ya go! Print, cut, assemble, enjoy! I have finally updated my podcast feeds! Took a little hiatus, there. Rough summer.